Lodger facilities from R.A.F. 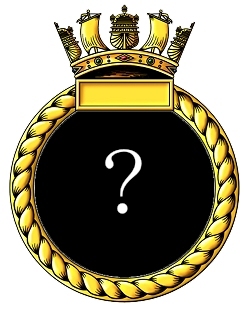 for an RN Air Section beginning in 1942. Naval Aircraft Erection Unit serving R.N.A.M/Y. Coimbatore. 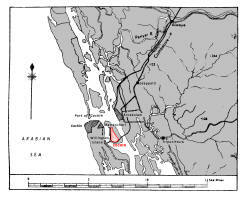 The airfield is located at the south end of Willington Island, in Cochin harbour, 2 miles SE of the town buildings of British Cochin, on the west coast of India. R.N. Air Maintenance Yard, Coimbatore, 90 miles NE. 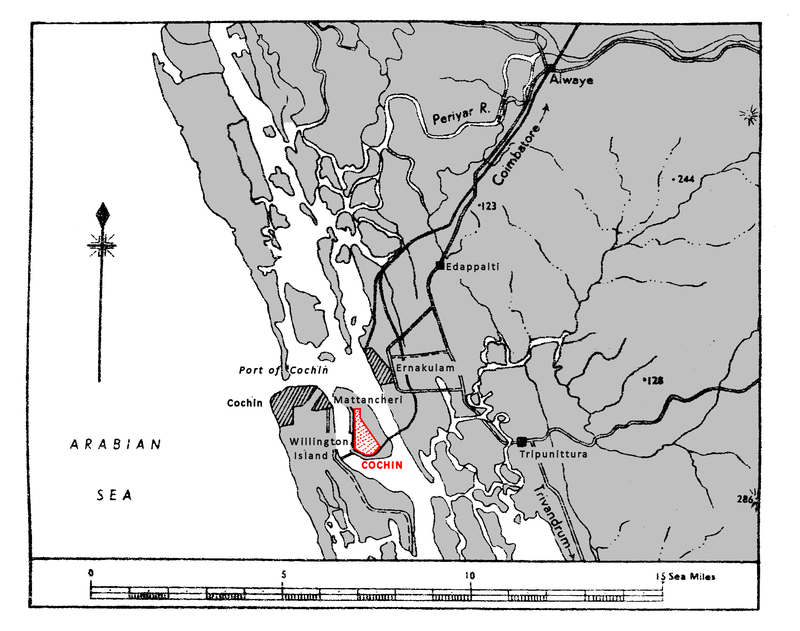 Willington Island and the town and harbour of Cochin, Bridges connect the southern end of the Island to the mainland at the east and west. Cochin harbour lies 8 miles S. of the N. end of a 48 miles of coastal lakes and lagoons. The South Indian Railway line enclose the airfield on the south and west, Mattancheri train halt situated at the SW. corner and the Cochin harbour terminus directly NW. Road and rail links to R.N. Aircraft Maintenance Yard, Coimbatore and R.N. Aircraft Storage Depot, Sulur. An access road with 60' clearance connects the N. end of runway 17/35 with the wharf at the terminus station. Loading platform and one 5 Ton, one 10 Ton, and several 3 Ton cranes available. Communication by launch, held by the section, to British Cochin (one mile by sea) and Ernakylam (two miles by sea). R.A.F. one storey Control Building on N. side of landing area, adjacent N. of taxi track. Three, Tar Macadam with sub-base of road metal on a consolidated earth foundation. 10/28 QDM. 101°-281° .... 1250 x 50 yds. 13/31 QDM. 132°-312° .... 1550 X 50 yds. 17/35 QDM. 169°-349° .... 1800 x 50 yds. 05/23 QDM. 048°-249° .... 990 X 50 yds. 50' taxi tracks connect the southern ends of the runways and a broad track connects runways 17/35 and 05/23 in the N. sector. Circuit and approach - there are numerous cranes, flagstaff's and buildings along the W. and NW. side of Willington Island, some adjacent to the airfield. The road bridge to Cochin State has a lift span (100') distant 875 yards W. from the S. end of runway 17/35. A safe approach can be made on any bearing from a radius of 5 miles at a height not below 300'. Windsock on W. side of runway intersection. Landmark beacon on airfield flashing letters "CC". Operated on request or when aircraft are expected in conditions of poor visibility. Living quarters in camp 1/4 mile N. of landing area. 16 aircraft standings. 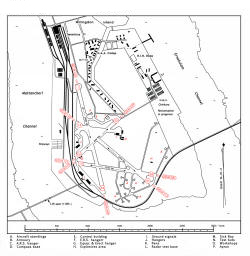 Main dispersal area is S. of the runways. On N. & W. side of airfield, for erection depot use only, there are no squadron hangars. In addition there is one R.A.F. hangar on the N. side of the airfield, close E. of the control building. Sick bay in camp. 700 bed combined military hospital in Ernakylam (2 miles by launch then 7 miles by road). From R.A.F. and R.N.A.S. Coimbatore. 25 yd. range for M.G. Disembarked from HMS EMPEROR 23/0545. Remarked in EMPEROR 09.06.45. Equipped with 20 Hellcat !Is. Disembarked from HMS HUNTER 054.06.45. Moved to RAF Vizagapatam 23.06.45. Equipped with 20 Seafire L.IIIs. Disembarked from SMITER 25.07.45. Moved to RNAS Katukurunda 27/07.45. Equipped with 10 Barracuda TR3s. Disembarked from ATHELING 06.10.44 - squadron disbanded here 14.10.44. Equipped with 4 Swordfish IIs. Disembarked form TRUMPETER 26.07.45. Moved to RNAS Katukurunda 11/08.45. Equipped with 12 Barracuda IIs. Moved here from RNARY Coimbatore 267.09.44 on route to embark in BATTLER the following day. Equipped with 12 Swordfish IIs and 6 Wildcat Vs.
Disembarked from SHAH 23.02.44. Re-embarked in SHAH 06.03.44. Equipped with 12 Avenger Is. Disembarked from ACTIVITY 07.10.44. Moved to RNAS Katukurunda 11.10.44. Equipped with 12 Avanger Is. Equipped with 20 Wildcat VIs. Moved here from RNAS China Bay 19.10.44. Moved o RNAS Colombo Racecourse 23.10.44. Equipped with 6 Hellcat II(PR)s.
A rudimentary airstrip was built on Willingdon Island, Cochin, Southwest India by the Cochin Port Trust in 1936 for the use of Colonial officials; it was taken over by the Royal Air Force in 1941 to establish an experimental station. The Indian Air Force Volunteer Reserve No. 5 Coastal Defence Flight, flying Westland Wapiti II aircraft was based at the station from May 1941 until it was disbanded in December 1942. 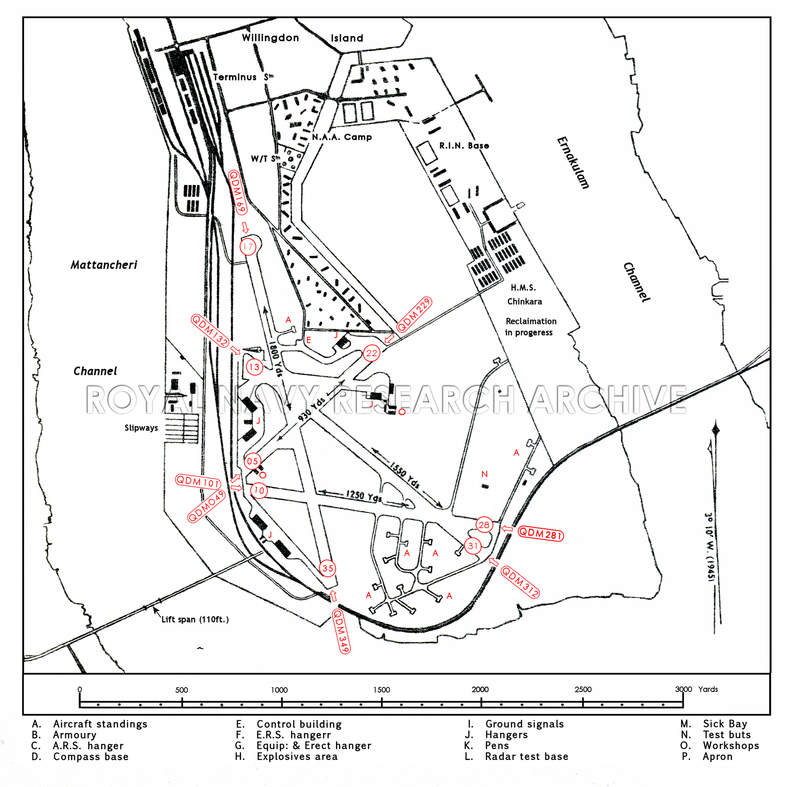 The site was developed into a major aerodrome which would eventually house No. 63 Embarkation Unit, formed in April 1943, and No. 312 Maintenance Unit. The station also supported detachments from No. 240 Squadron, July 1942 through to July 1945, initially operating Stranraer, and later Catalina flying boats, and 203 Squadron operating anti-submarine Wellingtons during 1944. 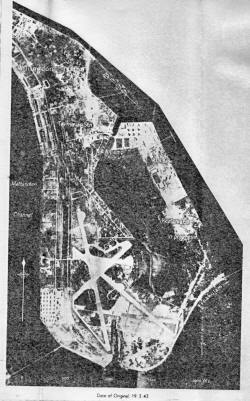 After the fall of Singapore at the start of 1942, and the increased threat to Ceylon from Japanese air attack, plans were made to establish naval aviation support facilities in Southern India to provide aircraft repair, maintenance and storage as well as the training of squadrons. In the spring of 1942 lodger rights were granted for an RN Air Section to be established at RAF Station Cochin, Its primary function was to operate a Naval Aircraft Storage Section; the first recorded use of the lodger facility is in March 1942 when Fairey Fulmar X8630 is recorded as being on the station and several Albacores in June. Later in 1942 a Naval Aircraft Erection Unit (N.A.E.U.) was established at Cochin to serve the new RN Aircraft Maintenance Yard at Coimbatore, and later in the war, the RN Aircraft Depot at RN Air Station Sulur. Crated and preserved airframes were delivered by sea, often by RN carriers, as reserve aircraft for issue to squadrons in the East Indies; the N.A.E.U. was tasked with receiving, assembling, and test flying up to130 aircraft per month. The Section, which was carried on the books of GARUDA (RNAMY Coimbatore), was commissioned as an independent command on February 1st 1945 bearing the Ship’s name KALUGU, but its accounts remained in GARUDA until April 1st 1946 when the stations at Coimbatore and Sulur were paid off. After the war the task shifted to aircraft disposal and the N.A.E.U. were erecting airframes with the express purpose of writing-off functional aircraft; hundreds of surplus American aircraft were loaded aboard carriers for disposal at sea. Under the terms of the Lend-lease agreement between Britain and the U.S. surplus equipment had to be paid for or returned to U.S. custody – the majority of the fighter planes would be surplus on return to the U.S. so they were “written off” at sea. On completing this task the RN Air Section was itself paid off on October 1st 1946 and the station continued as RAF Station Cochin. No. 63 Embarkation Unit was still present on the station and was renamed RAF Movements Unit (Embarkation) Cochin, on February 10th 1947. This was withdrawn and the station had closed by August of that year when India became an independent nation. On 1 January 1953 the aerodrome at Cochin was transferred to the Indian Navy for use as the forces first Naval Air Station. 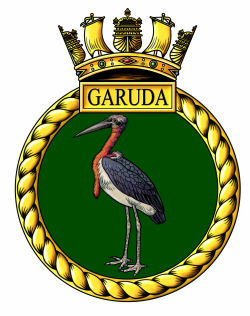 It was initially under the control of the nearby naval base, INS VENDURUTHY; the facilities were commissioned as a fully operational Indian Naval Air Arm station of the on May 111th 953 and renamed INS GARUDA. It is the oldest operating naval air station of the Indian Navy supporting squadrons and several training schools, intelligence centres, maintenance and repair facilities. The station is extant in 2018. 511/45 Commissioning as independent command with ship's name KALUGU, accounts held by GARUDA. 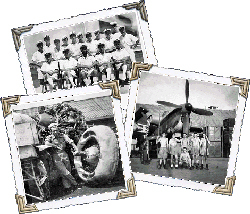 Mr. Michael Moore supplied the war-time photos of his father, Air Mechanic Dennis Moore.